Sounds from volcanic processes (also known as volcano acoustics) that occur before an eruption primarily come from the pressurization of magma bodies in cracks and conduits, bubble explosions, and the resonating superheated hydrothermal systems near the surface of a volcano. As magma ascends, moving toward the surface, gases build pressure within the magma, forcing cracks and dikes to open and expand through the overlying rocks. The high pressures associated with the gas-rich magma within these cracks, pipes and conduits can cause the volume to resonate similar to a pipe organ. The acoustic signal emitting from resonating bodies of gas rich magma, large bubbles, and or high pressure hydrothermal fluids within the volcanic edifice is often referred to as volcanic tremor. The fundamental frequency of the tremor is related to the volume of the resonating body and can change through time causing an effect known as "gliding". Gliding may occur as a result of a change in the properties of the magma body as more gas is exsolved and/or the crack holding the fluid/gas mixture opens or closes. Volcanic tremor is often used in conjunction with earthquake swarms as a geophysical warning that an eruption is not far off since it is often the direct result magma forcing its way up toward the surface. This is an example of harmonic tremor from a resonating seafloor volcano. The lower frame shows the raw signal recorded by the hydrophone at 250 times per second (250Hz). The upper figure is called a spectogram and is the frequency representation of the lower frame with brighter colors indicating higher energies. 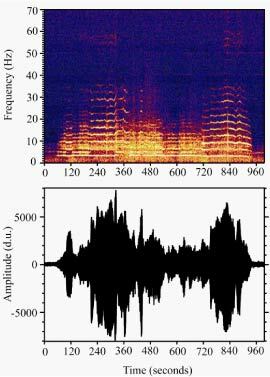 A fundamental frequency around 3Hz with multiple harmonic overtones up to around 60Hz is evident as well as some gliding behavior with the frequency structure changing through time as described in the text above. Another sound that is often heard and recorded during the periods between and building up to an eruption is caused by earthquakes from cracking and elastic behavior of the overlying rocks as magma pushes its way to the surface. On land, these earthquakes are often difficult to hear and only the larger events are audible due to attenuation properties of the signals in air. In the ocean, the acoustic waterborn phase of earthquakes known as a T-phase can travel great distances and have been well recorded. This earthquake or seismic activity often increases substantially prior to an eruption and is often used as the primary indicator for eruption predictions. 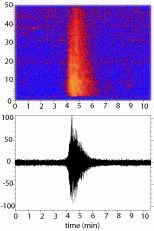 Similar to the above figure, the waveform and spectogram of a T-phase earthquake are shown above. Swarms of these earthquake sounds are a good indication of magma moving beneath the crust and often preclude eruptive activity.